Sixth Printing 2013, and Copyright from 2009 on. Also uses Open Game License content, compliant with version 1.0a, Copyright 2000 by Wizards of the Coast, Inc. Almost 200 years ago, when the land that was to become Nirmathas was still a vassal of the Empire of Cheliax, the northern reaches of the Fangwood were a wild and untamed place. The crusades that laid low the Whispering Tyrant to the north were a distant memory, and those who remained were intent upon keeping the orcs of Belzken and the remaining undead from Ustalav in check. As a result, the Great Forest was full of danger, from marauding orcs to deadly predators, making it unsafe for merchants hoping to trade with the growing community of Skelt in the foothills of the Mindspin Mountains to the west. Ekat Kassen was a crusader and fortune seeker who came to serve Lastwall in the year 4515 A.R. While he fought with distinction, he soon realized that he wanted more from life and left the Lastwall military to find his fortune elsewhere. His travels took him all over the region around Lake Encarthan, and he decided to settle down in 4522 after a very profitable adventure. Using a sizable portion of his fortune, he set out to tame a small area of the Fangwood on the banks of the Tourondel River, making it a natural stopover for those traveling up and down the river to Skelt. For the next 10 years, the town, which was then known as Kassen's Hold, grew and prospered. All that changed when Asar Vergas came to Kassen's Hold with a host of mercenaries under his command. Asar was an old companion of Ekat, and the two had traveled together for some time before splitting up just after Ekat's last adventure. Over the years, Asar became sure that Ekat had cheated him after that adventure. Promising great wealth to his mercenaries, Asar raided the town relentlessly for two months. Finally, the townsfolk managed to locate Asar's camp in an ancient crypt deep in the forest, and Ekat himself went out to deal with his old companion. The battle was terribly bloody, with only a few townsfolk coming back to tell the tale. In the end, Asar was slain and his mercenaries scattered, but Ekat suffered a mortal wound. He died two days later, on the 11th of Neth, 4535. In honor of their beloved founder, the townsfolk buried Kassen in the ancient crypt, interring his bones in a place of honor, above the simple sarcophagi used to inter Asar, his mercenaries, and the townsfolk that lost their lives in the bitter struggle. They placed an eternal flame above Kassen's final resting place, so that all who visited might find warmth in the wilderness. Over the years, the Crypt of the Everflame has become an important part of the history of the town, now simply called Kassen. The townsfolk view the crypt as a memorial to those difficult first years of the town's history. Every autumn, a few of the townsfolk make a pilgrimage to the crypt to light a lantern from the flame and bring it back to town, where it is preserved all winter, a symbol of the town's resilience. Most years, the town mayor and a group of dignitaries perform this quest. Every few years, however, a handful of younger townsfolk are given the honor of lighting the lantern. Many see this as a passage into adulthood, a taste of adventure before settling down to work and marriage. 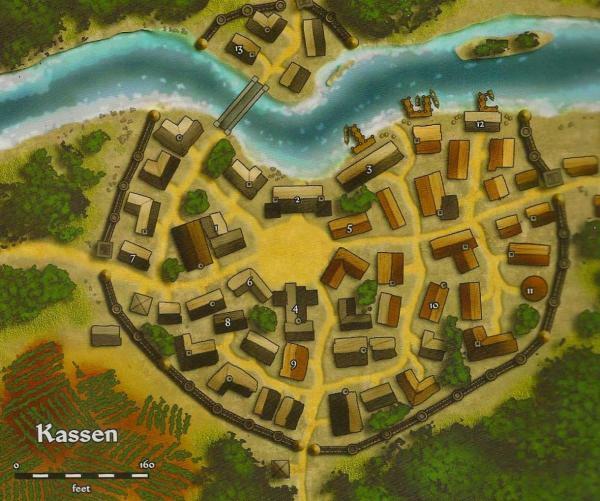 The quest starts out as a solemn ceremony in town, where the townsfolk gather to wish the adventurers luck, just as it was when Kassen himself left to fight the mercenaries. When the adventurers return a few days later, the town holds a great celebration in their honor. This also marks the final harvest celebration before the long winter. Over the years, the four of you have led differing lives, but fate has had you all settle temporarily in Kassen. You learn of the regions history in your brief time in and around the city. You have all four decided independently to become adventurers, and find this "Sanctioned" adventure a good starting point. Essentially, complete this adventure and the town will respect your abilities to embark on an adventuring career, should you so choose. To further this end, each of you has bonded with a like minded veteran in town. They have mentored you to the best of their abilities. Khim Leadgrinder, your mentor has been Ilimara Oniri, a neophyte female human monk. While most of the people in Kassen were born and raised within 10 miles of town, Ilimara was born in Qadira in a town with a name most of the humble folk in Kassen could not even pronounce. Not surprisingly, this beautiful and exotic woman keeps to herself. She has lived on the outskirts of town for almost eight years now, claiming that she is trying to find peace in her heart. Ilimara has had a number of acolytes over the years, each hoping to learn the secrets of Irori that Ilimara claims to practice, but so far, all have abandoned her tutelage for a simpler road. Anyone who learns from her, however, quickly uncovers that there is a darkness hiding in Ilimara, and only those with an iron will can bear to be around it. Taeral Half-Elven, your mentor has been Arnama Lastrid, an accomplished female human ranger. Nirmathas is known for its rangers, valiant woodsmen who have spent years carving out a nation and protecting it from foreign and domestic threats. Arnama is one such ranger. She is tough, quiet, and more than willing to risk her life to protect the people of Kassen and the country she has grown to love. Arnama was orphaned during the early wars with Molthune, growing up in a band of adopted parents. These rangers taught her everything she knows. When Arnama came of age, she left the band to find out where her parents came from. That trek led her to Kassen, where she has remained ever since, living in their old house just outside town. Arnama is a skilled ranger, but not the best teacher. Those who have tried to learn from her find her impatient and without discipline. She does, however, excel at teaching by example, leading her charges on far-ranging patrols and hunts. Morgrym Forgefounder, your mentor has been Father Rantal Prasst, a male human fledgling cleric of Erastil. The small town of Kassen has only one temple, and it is devoted primarily to Erastil, but Father Prasst allows those who worship other friendly gods to pray at the temple as well. While Father Prasst does not offer services in the names of these other deities, there are small shrines to other gods set up in some of the alcoves, including Sarenrae, Gozreh, Gorum, Shelyn, and Torag. Father Prasst is a kind and understanding man, but he is hard when it comes to the defense of the community. He is quite young, only 24, and many in the community do not put too much faith in his council, except in spiritual matters. He was trained as a soldier in Tamran, but he left after his first battle to become a priest, and refuses to say why. Quigley Nimblefingers, your mentor has been Jimes "Short Change" Iggins, a male Halfling "waiter" at the Seven Silvers tavern. You came in panting one day on the lam, and Jimes sized you up, threw some cant signs your way, and sheltered you from your latest fumbled lift. Those who frequent the Seven Silvers tavern know to count their coins before they leave the table, especially if they have been served by "Short Change," the Halfling waiter who has a propensity for giving less change than is due (although he insists the name is due to his short stature). Although Jimes is genuinely kind and helpful to all the locals, he just can't help but end up with some of their possessions at the end of the night, be it a few coins or a loose dagger. Most of the townsfolk are quite aware of this and do not take too much offense if something goes missing. After all, they know where the missing goods went. Anyone who works with Jimes at the Seven Silvers is sure to get a host of tips and tricks from this good-natured thief, who thinks that a little petty theft is all in good fun. 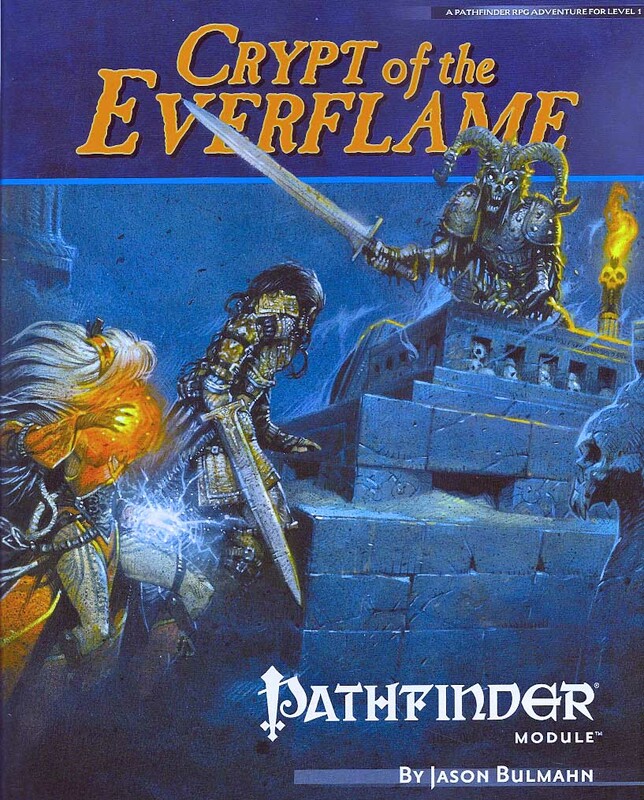 It has been four years since Mayor Uptal sent a group of would-be adventurers to the Crypt of the Everflame. This year, he has a group of adventurers of an eclectic mix of backgrounds eager to show the town they have the mettle to venture into the Crypt of the Everflame and emerge with the lantern lit by the continual flame. The time has come, and the Mayor summons you all to the town square. The bells atop the Temple of Erastil toll their midday song, echoing throughout the quite town of Kassen. As the peals begin to fade, the first of the townsfolk make their way into the square, dressed in black, as if attending a funeral. They slowly fill the square, moving quietly across the cold, hard ground, their eyes downcast and mournful. After a few moments, a murmur passes through the crowd as it slowly parts to let Mayor Uptal through. He leads the way with a tarnished silver lantern. Behind him, an old pony drags a cart laden with backpacks and supplies. Once he reaches the center of the crowd, Mayor Uptal stops and calls out to the assembled townsfolk. "Once again the winter winds blow through the Fangwood, marking the end of another harvest. There are wolves in the woods, howling at our walls, and serpents in our shadows, waiting to strike. Just as it was 174 years ago, when Kassen himself left these walls to protect us, so it is today. Where are the heroes? Where are the brave folk that will venture out to Kassen's Tomb and retrieve the flame to keep this community safe for another winter?" Khim walks up, bows to mayor Uptal, Ilimara, then to the crowd. "I am like the dawn, I will return with the light"
Khim is a male dwarf, with blond hair that is shaved to a topknot down to his waist and neatly braided beard mid chest in length. He is nowhere as stout as your typical dwarf. He walks with grace and stands with his hands tucked in his lose fitting 2 piece robe that is dark grey in colour. Morgrym also walks up to the mayor bows and says "I will also stand to bring light to the darkness as my god brings dawn to the morning"
Morgrym is also a male dwarf but every bit as broad as his warrior forefathers. His hair is bleached by intense sun and his skin the color of red mahogany. He wears scale armor, each plate polished to blinding intensity. He walks with a stalwart even pace, not overly graceful but with strength and power. Upon entering the scene Quigley does a bow with a tip of his feathered hat. "Good day ladies & gents. I am pleased to make your aquaitances." The gnome wears fancy clothing but nothing over the top. His dark hair is slicked back. He carries a rapier at his side with a dagger tucked in his belt. We wait for at least one more. Do you look to quest to prove yourself or to others. And in a lower voice "and do you think there will be time for a pint be for we go?" "Would be nice. Never know when we might get comforts of civilization again." Quietly Khim says "I look to prove to my Sensai that I am ready to go out in the world". I look askance towards Morgrym, smile, and nod, " a pint or two will help get the throat ready for the road dust. " I grab Morgrym's wrist for a vigorous hand shake and then clap the gnome on the shoulder. Morgrym returns the handshake with a firm grasp looks around and aasks "wasn't there one of the taller folk who were going to join us as well?" "Maybe he already partaking in some refreshments? "